A rigid material whose structure lacks crystalline periodicity; that is, the pattern of its constituent atoms or molecules does not repeat periodically in three dimensions. In the present terminology amorphous and noncrystalline are synonymous amorphous solid, any noncrystalline solid in which the atoms and molecules are not organized in a definite lattice pattern. Such solids include glass, plastic, and gel. Amorphous solids have two characteristic properties. When cleaved or broken, they produce fragments with irregular, often curved surfaces; and they have poorly defined patterns when exposed to x-rays because their components are not arranged in a regular array. An amorphous, translucent solid is called a glass. If an amorphous solid is maintained at a temperature just below its melting point for long periods of time, the component molecules, atoms, or ions can gradually rearrange into a more highly ordered crystalline form. An amorphous solids journal includes the subject areas like Theoretical Physics and Structural Chemistry. Crystalline solids consist of atoms, ions and molecules arranged in definite and repeating three-dimensional patterns in a highly ordered microscopic structure, forming a crystal lattice that extends in all directions. Unlike amorphous solids that melt at a range of temperatures, crystalline solids have definite melting points. Crystalline solids include metallic, ionic, network atomic and molecular solids, and true solids are crystalline. Crystalline Solids journals main focus is within the fields of Materials Chemistry and Chemical Physics, Thermodynamics. A single crystal or mono crystalline solid is a material in which the crystal lattice of the entire sample is continuous to the edges of the sample, with no grain boundaries. A crystalline material in which there is long-range order. Such a material has no grain boundaries, so it is completely uniform throughout the entire crystal, regardless of its size. Used, for instance, as semiconductor materials of the highest quality. The subject areas covered by single crystal journals embrace the fields of physics, chemistry, material science, chemical engineering, metallurgy, crystallography. 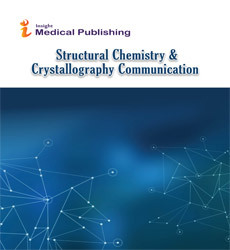 Structural Chemistry & Crystallography Communication is an academic journal for publishing science related to structure, with primary focus on the field of structural chemistry. The scope of the journal is very broad and offers interdisciplinary research results in crystallography and different kinds of spectroscopy. It also deals with areas of crystal chemistry and physics and their role in molecular structure. The Journal provides the platform to publish these new ideas. The journal serves to distribute the latest information in all related fields for effective and rapid communication among the audience which includes engineers, researchers and students. The journal specializes in the rapid publication of articles that highlight interesting research enabled by the determination, calculation or analysis of small-molecule crystal and molecular structures in the chemical sciences. The topics covered are related to but not limited to structure of single molecules and radicals, molecular assemblies, gases, liquids including water and solutions, amorphous and crystalline solids, surfaces, films and nanoparticles, molecular and polymeric materials, single crystals, coordination polymers, inorganics and minerals, ionic liquids, liquid crystals, molecular recognition, nanostructures, natural products, NMR crystallography, organic polymers, polymorphs, powder diffraction, solid-state organic chemistry, structure and spectroscopy, supramolecular chemistry. Structural Chemistry & Crystallography Communication is a peer-reviewed open access journal that aims to publish the most complete and reliable source of information on discoveries and current developments in the mode of original articles, review articles, case reports, short communications, etc. in the field and provide free access through online without any restrictions or any other subscriptions to researchers worldwide. Articles submitted by authors are evaluated by a group of peer review experts in the field and ensures that the published articles are of high quality, reflect solid scholarship in their fields, and that the information they contain is accurate and reliable. Structural Chemistry & Crystallography Communication uses Editorial Manager System for a qualitative and prompt review process. Editorial Manager is an online manuscript submission, review and tracking system. Review processing is performed by the editorial board members of Structural Chemistry & Crystallography Communication Journal or relevant experts from other universities or institutes. Minimum two independent reviewer’s approval followed by editor approval is required for the acceptance of any citable manuscript. Authors may submit manuscripts and track their progress through the editorial system. The overview of the way chemists understands chemical structure, and how that understanding is essential in developing a good knowledge of chemical reactivity and mechanism. The remainder of the text presents a mechanistic classification of modern organic chemistry, developed in the context of synthetic organic chemistry and exemplified by reference to stereo selective synthesis and protecting group chemistry. This approach is intended to illustrate the importance and value of a good grasp of organic reaction mechanisms, which is a prerequisite for a broader understanding of organic chemistry. Organic Structure and Reactivity Journals focus is within the fields of Organic Chemistry, Applied Chemistry and Medicinal Chemistry. Structural Isomerism, or constitutional isomerism (per IUPAC), is a form of isomerism in which molecules with the same molecular formula have bonded together in different orders, as opposed to stereo isomerism. There are multiple synonyms for constitutional isomers. In Structural isomerism, the atomes are arranged completely in a different manner. Mainly, Structural Isomerism Journals focus is in the fields of Physical Chemistry and Organic Chemistry. The three dimensional shape or configuration of a molecule is an important characteristic. This shape is dependent on the preferred spatial orientation of covalent bonds to atoms having two or more bonding partners. Molecules are made of fixed numbers of atoms joined together by covalent bonds, and can range from the very small (even down to single atoms, as in the noble gases) to the very large (as in polymers, proteins or even DNA). The covalent bonds holding the molecules together are very strong, but these are largely irrelevant to the physical properties of the substance. Physical properties are governed by the intermolecular forces - forces attracting one molecule to its neighbours - van der Waals attractions or hydrogen bonds. Structure of Molecules journals are associated with the fields of Molecular Biology, Structural Biology and Bio Chemistry. In the condensed structural formula, each carbon atom is written separately and following each carbon atom are listed the other atoms that are bonded to that carbon atom. In this case the first carbon atom has three hydrogen atoms bonded to it, the second carbon atom has two hydrogen atoms bonded to it, the third carbon atom has two hydrogen atoms, and the fourth carbon atom has three hydrogen atoms. Another even more condensed way of writing a condensed structural formula is this. It points out that there are two CH2 groups in the middle of the molecule by having (CH2)2 in the middle of the formula. Condensed Structure journals embrace the fields of Chemical Physics and Applied Physics. In crystallography, a crystal structure is a unique arrangement of atoms, ions or molecules in a crystalline liquid or solid. It describes a highly ordered structure, occurring due to the intrinsic nature of its constituents to form symmetric patterns. Crystallography Structure Journals cover varied fields like Structural Chemistry and Material Chemistry and Metallurgy.